Bearing manufacturer NKE Austria GmbH held its sixth Distributors’ Conference from 31 May to 3 June 2012. Attended by 170 people from 30 countries, the conference was held in the town of Baveno at the Maggiore Lake in northern Italy. Taking place every two years, the event provides NKE’s global business partners with a platform for exchanging experiences and ideas. The conference opened on 31 May with an evening reception in the hotel on the banks of Lake Maggiore. The following day saw discussions about the current economic environment and developments in technology and supply chain, and the effects and resulting opportunities of these on the bearing market and on NKE. The day concluded with a gala dinner in the historic Castello Dal Pozzo. The excursion on the second day gave conference participants a chance to enjoy the lake’s picturesque islands. The conference ended with the guests’ departure on 3 June. 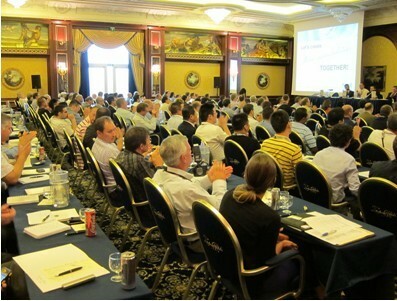 The next NKE Distributors’ Conference will take place in 2014. “Distributors are still our most important business partners, our extended sales team”, explains Heimo Ebner, Commercial Managing Director at NKE. “With the local and regional customer service they provide they are a vital link to our end consumers.” Beside product development and application engineering, NKE supports its trading partners with comprehensive bespoke technical service and training. NKE’s rolling bearings are distributed through 18 international representative offices and more than 240 distribution outlets in 60 countries.